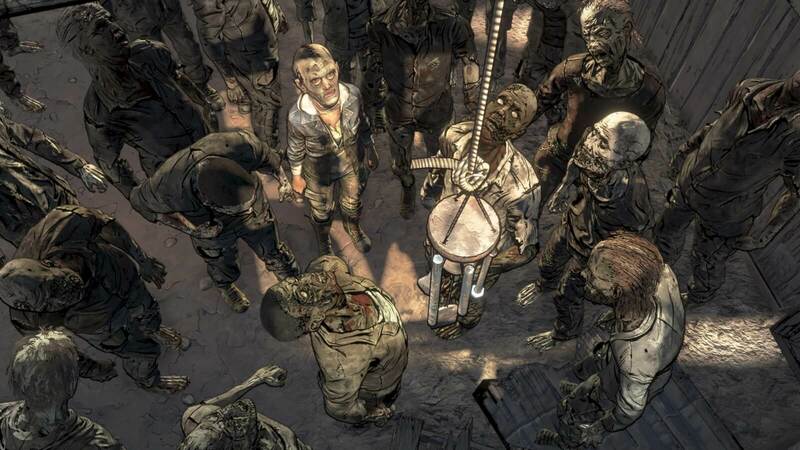 It looked as though The Walking Dead might have been an apt name for its own existence after Telltale Games closed halfway through the development of this final season. In many ways, the writing had been on the wall for the studio after some distinctly subpar games were churned out in a gruelling schedule. The Walking Dead was the flagship though, the IP which put Telltale on the map. An astonishing first season combined innovative dialogue mechanics with more traditional — and lighter — point-and-click gameplay, but the real highlight was a story which was brutal, gripping and often devastating. The second season lost a little of its lustre at the midway point but managed to ramp up to a worthy finale, even if the illusion of impactful choices throughout had well and truly been shattered. There was much expectation surrounding the third season but A New Frontier unfortunately represented the worst of Telltale — a shoddy, ageing engine plagued with technical issues, a dull storyline, and worst of all, Clementine being relegated from starring role to a bit-part player. What hope, then, could The Final Season offer, when its developer went under two episodes in? Step forward, Skybound Entertainment. The production company owned by Robert Kirkman, The Walking Dead’s creator, took over the reins after Kirkman decided that Clementine’s journey needed a satisfactory ending. With four episodes instead of the usual five in which to wrap things up, the story promised to be less flabby and new gameplay elements a little more dynamic. Experiencing the season in straight sittings without the usual wait of weeks (and often months) between episodes allows you to play through the story with characters and plot elements fresh in your mind, building up a more accurate picture of the season’s overall quality. The first thing of note in the opener, Done Running, is Clementine’s return, along with voice actor Melissa Hutchison. Now a teenager in charge of orphaned youngster AJ, Clem has had to grow up fast. 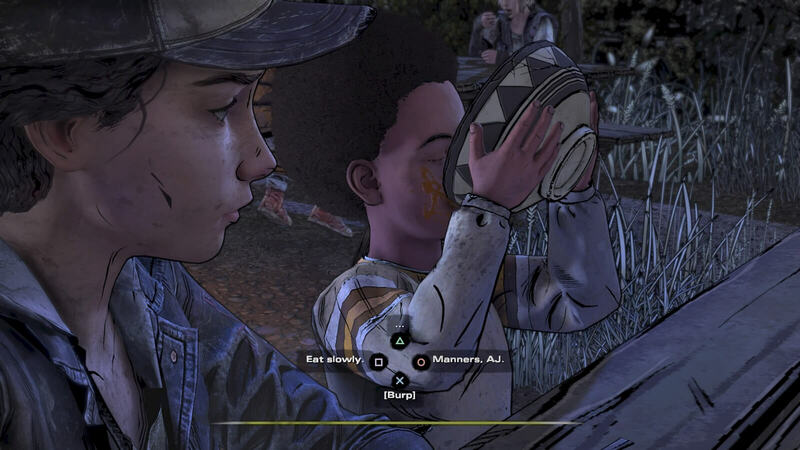 Just as Lee — and the player — provided the moral guidance to shape Clem’s outlook, here Clem takes on the role of mentor for her young companion. The pair of them are living day-to-day when we first meet them, scavenging for food, avoiding walkers and trying to survive. That all changes after an encounter with an extremely unpleasant man named Abel who gatecrashes just as they discover a bumper store of food. Free action sequences help mix things up. This encounter ultimately leads the pair to be rescued by a group of kids holed up in a nearby boarding school, which serves as both the main location and narrative centre of the season’s arc. Done Running is a slow burner, introducing us to the kids who appear to be leading a Lost Boys meets Lord of the Flies lifestyle, with Kiefer Sutherland lookalike Marlon trying his best to look after the gang. The rest of the kids are plucked from Telltale’s usual mixed bag of supporting characters: the tomboy, the arty musician, the angry guy, and so on. They are defined more by their temperament at any given moment than their background, despite multiple rounds of Truth or Dare which fail to elicit any meaningful information about them. New to the franchise this time around are more action-oriented sequences which provide a little more elasticity to the usual hard framework of quick time events. 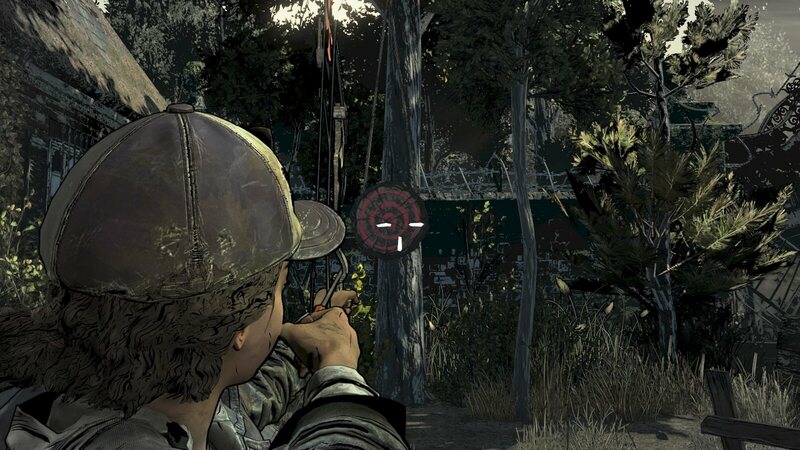 It’s now possible to move Clem around during some encounters with walkers, although the majority of those battles involve little more than hitting one button to stun them followed by another to kill them — a move which quickly becomes repetitive by the second episode, Suffer The Children. Other sequences see you utilising a bow and arrow whilst navigating open areas, picking off incoming zombies. The random shuffling nature of the creatures proves a challenge, but then so too does the sluggish cursor which seems to take an age to register movement both here and in other QTEs. Still, it’s a welcome change after three seasons of the same old, and means that more thrilling action sequences — such as at the end of the second chapter — don’t make you feel like you’re going through the motions of playing Simple Simon. The improved Telltale Tool deserves a lot of the credit here. In addition to the gameplay changes, the engine has all but eliminated the dreaded stutter that became a staple of the studio’s brands. Technical glitches are few and far between, and the graphical overhaul results in more detailed environments and more expressive characters and animations than previously. Jared Emerson-Johnson is once more on composition duty, plucking motifs and refrains from the series to date and mixing in new themes in typically competent fashion. Overall though, it looks better and feels a little less inflexible mechanically. But aesthetic and action were rarely the draw for Telltale’s offerings — their USP was in the story and the often heart-wrenching choices you were forced into making. Here, The Final Season is a mixed bag. Being The Walking Dead, of course, it is impossible for any group of people to stay safe, in harmony, or both. The entire series is predicated on survival in a world gone to hell, which brings out the very worst in people. Where the books — and occasionally the series and games — got it right was painting characters in shades of grey rather than binary paragons or pariahs. The worst people were capable of redemption despite previous deeds, and the best of them capable of acts far more heinous than they thought possible. AJ’s development by Clem sits front and centre throughout, which makes it all the more frustrating when major story beats are carried out regardless of how you’ve behaved in front of him, or what you’ve told him specifically. The first episode in particular feels like you’re being funnelled down a specific path for the sake of both shock value and setup for later chapters. The Telltale Tool has improved the graphics significantly. In this regard, Telltale appears not to have learned its lesson. Though the branching dialogue choices offer an occasional different flavour to most chats, rarely are they significant. The end of each chapter reviews your relationships with each of the characters you’ve met during the game, labelling them as “Frightened” or “Bitter” or “Resentful” and so on depending on your interactions with them. But this feels like window dressing since even though the game tells you that your “relationship with character X has changed”, there’s no in-game yardstick by which to measure how it’s changed. It’s hard to feel engaged when you can legitimately stay quiet for 80% of the game’s conversations and watch it play out in much the same way. If the voice acting was great, this might not be a problem but it’s just too variable: some of the kids sound older than they look, some younger, and many (Willy, James) are just plain annoying. There’s very little nuance, which in part is down to the writing. Everyone is angry or on the cusp of being angry much of the time, resulting in a cavalcade of pretty miserable conversations peppered with the occasional light relief before the gloom returns. More prominent — and better acted — side characters such as Violet and Louis are clearly given more focus by the script to the detriment of the rest of the kids who number at least two too many. So many kids. Which will survive? By the end of the third episode Broken Toys, though, the game has found its feet. There are a few surprises and some familiar faces make an appearance, but it’s the final chapter which really raises the quality of the overall package. 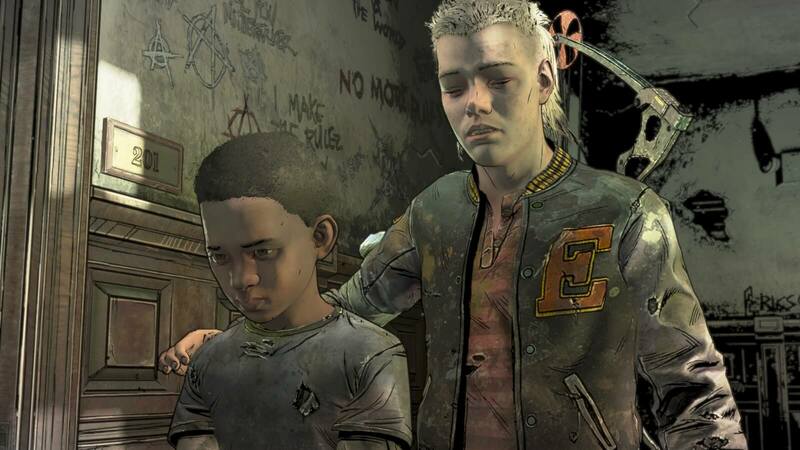 The send-off for the season and the series as a whole is two hours of tight, tense gameplay which ties together the threads that have been dangling from the choices you’ve made, especially regarding Clem and AJ’s relationship. Doing so involves manipulation of both the player and the very lore of The Walking Dead to produce moments which are in turn heartbreaking and awesome in equal measure, assuming you get on board with some established rules being broken in favour of cinematic flair. As such, the finale proves to be a fitting one for Clementine, a character we have spent years nurturing to bring her to this point. While the resolution of The Final Season may be divisive in some sections of the gaming community, the four-episode arc proves to be at least on a par quality-wise with the second season. Skybound has done justice to Telltale’s legacy, and while nothing has equalled the story of Lee and Clem in that brilliant first game, at least there is some closure to the series which lets it go out on a solid high. 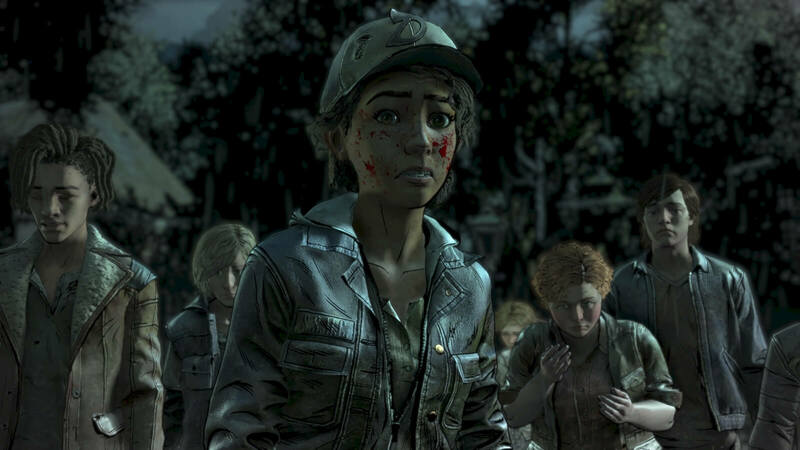 Clementine’s final season starts out uneven, but the second half provides enough thrills, tension and deliberation to ensure that after seven years The Walking Dead gets a decent farewell.